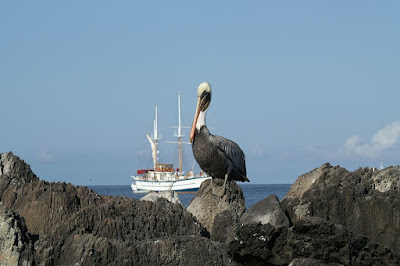 About 8 years ago my aunt and uncle had the pleasure of visit the Galapagos Islands and when they went there they were fortunate enough to do so by taking a Galapagos Cruise. My aunt Helen told me that the islands were very beautiful and that they had a great time on the cruise ship but also enjoyed the many trips and tours they took on the mainland. My aunt told me about all of the hiking they did with a very informative tour guide and then one afternoon they went out fishing on a little boat with a few people they had met on the cruise ship and had a great time doing that. Their cruise was a 4 night cruise and the next time around they want to take a 7 night cruise. She told me that Galapagos Cruise Ship was very clean and they had a beautiful stateroom with a private balcony. She also said the food was top notch! Unlike other big cruise ships she said they didn't feel over-crowded at all and didn't have long wait lines either. Now that I have heard all about her great journey hubby and I are looking into a few Galapagos Cruises for ourselves. Perhaps we can take one next spring for our 26th wedding anniversary and if we do...I will make sure that I take a lot of photos and document it here on my travel blog.